We would like to thank everyone who reads this blog---and especially those who write to us. We love hearing from you and seeing your photos. "I enjoyed your piece about the old Sonora Pass road. It’s pretty cool that you can still find it after all this time. The road was not used by “early immigrants,” as you suggest but was mainly a commercial route for men and materiel between California and the mines in Nevada. It was opened in 1864. There was an earlier route to California that actually was used by early immigrants in the early 1850’s. 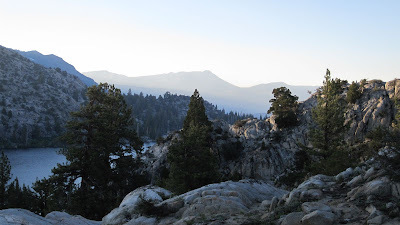 It went over “Sonora Pass” but had nothing to do with the road that you were exploring. It was a different pass entirely. The route went up through Leavitt Meadows past Fremont Lake and turned west just a bit short of Cinko Lake to go over the pass. 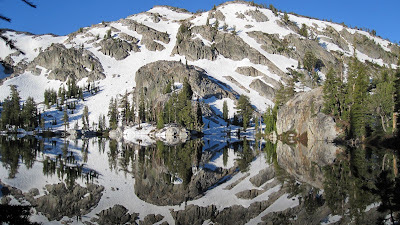 It then wound its way through the Emigrant Wilderness down to the town of Sonora. There is no trail there today, and you will not find the “pass” on any modern map. The historical plaque at the current Sonora Pass is misleading. "If you are wondering how the pioneers got their wagons over such rough country the answer is that they often didn’t. It was an absolutely terrible trail, far more difficult than the Carson Pass trail to the north, which had a lot more traffic. In the few years that it was in use it became littered with the carcasses of dead stock, abandoned goods and entire wagons. It was promoted by the good citizens of Sonora who were concerned that the more northern route was directing settlers away from their town. They wanted respectable settlers rather than the riffraff that was attracted to the mines. They told folks that the Sonora Pass route was best way to cross the mountains, which was emphatically not the case; but hundreds believed them, much to their sorrow. Marketing! "The better road that was completed in 1864 was originally supposed to go up the Clark Fork and then on up to St. Mary Pass. As the work progressed, however, the surveyors found a route they liked better — the current one that follows Deadman Creek, and the rest is history. " We've hiked up Leavitt Meadows and past Fremont Lake to Cinko Lake years ago--wonderful area. And Walter is right: we didn't notice any abandoned pioneer route there. The top photo in today's blog is along the trail above Leavitt Meadows. The second one is Fremont Lake. And the one at left is Cinko Lake. So thank you all for helping us along our journey--and especially Walter, who makes an effort to keep us on the right trail. Hope you have a wonderful day today, and that you manage to get out into the mountains soon.